And so the wait is over. That famous old British manufacturer, Canterbury of New Zealand, has (following a teaser campaign that had us on the edge of our seats in anticipation) finally revealed its revolutionary new kit design for the England rugby team. And the verdict? Pleasantly surprised – at least as far as the home kit goes. After all, you can’t go too far wrong with a traditional white shirt, white shorts and navy (or "midnight blue") socks. As ever, I’d have liked a collar but you can’t have everything. 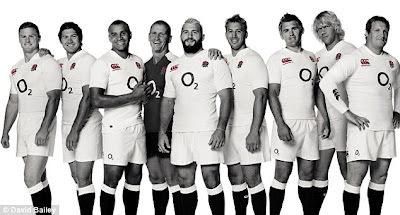 There is, of course, the usual gimmicky nonsense, with the slogan ENGLANDCONNECTED - which "acts as a reminder of the rugby family" - apparently embroidered on the inside of the sleeve. And no England kit announcement would be complete without the expected ridiculous away kit (this time in a colour that won't show the red wine stains from post-match festivities - somewhat ironically modelled by Danny Care). Officially it's "regal purple" - which according to the RFU "reinforces England's position as a member of rugby royalty". Good grief. All in all, however, I’d say we’ve dodged a bullet on this one. Well it looks like the much berated England shirt designer of old has signed for Scotland. Help!! !